A movement of three hundred thousand, with 3,000 blockades, what is the Gilets Jaunes movement? The Gilets Jaunes (Yellow Vests) movement emerged in France in November. It got its name from the high visibility tabards that those who take part in the actions wear. It is a movement mobilising around rising taxation, in particular the tax on diesel. It was able to undertake actions in rural areas like the Aveyron department where 2,000 took part in blockades in villages, in small towns like Villefranche de Lauragais where 300 demonstrated and Montgiscard, where 200 came out on the streets. On November 17th more than 300,000 took part in blockades of roundabouts, supermarkets and petrol stations. This action continued on the following two days. However the demonstrations have seen large scale brandishings of the tricolour, the French national flag. Indeed the extreme right is one of the components of the movement, with groups like the monarchist (and anti-Semitic) Action Francaise, the openly fascist GUD, etc. A Muslim woman wearing the veil was forced to take it off by some demonstrators and there were many racist insults against black and Arab people. At one blockade Yellow Vests saw immigrants hiding in a truck and called the police. People perceived as homosexual by these demonstrators were insulted or held up longer in the blockades. These acts are partly attributable to the far-right groups. But, and a big but, in many places there were attempts at self-organisation, with social and ecological demands that went beyond the Macron tax on diesel. The movement is very mixed, with on one hand, the aggressive waving of the tricolour as already mentioned and on the other, crowds made up of families with their children in a festive mood. Various self-proclaimed spokespeople have come forward to speak on behalf of the Yellow Vests. These have included local bosses, right-wing and far right activists. This shows the attempt by these different interest groups to claim the movement for their own. However, the spreading of blockades then caused the bosses organisations MEDEF and SME to call for the end of these blockades. The Macron government has imposed a tax on diesel in the name of environmental concerns. But this is the same government that has no tax on fuel for airplanes and private jets and cruise ships. It is the same government that has closed railway lines, forcing people to use cars. It is the same government that has closed down hospitals, maternity centres, tax centres and post offices, forcing people to travel miles. The broad slogan of “Ras-Le-Bol Fiscal” (Fed Up With Tax) has united the working class, shopkeepers, craftspeople and employers in a vaguely defined movement. Some transport employers joined the demonstrations because they saw an attack on their profits. The far right quickly participated in the movement followed by different currents of the left and right who did not want to miss the opportunity of taking part in a movement of such size. Among some Yellow Vests there were opinions expressed going beyond the opposition to fuel tax rises to include opposition to contributions to social assistance and social security and pensions. These neo-liberal opinions would certainly legitimise the plans of the Macron regime for further attacks on public services and social security. All the same, the Yellow Vests movement has given a strong indication of the simmering anger throughout France, a France of precarity and austerity. In particular, that anger is being expressed in what are now rural deserts where transport, health services and schools have been wiped out. It could point to the emergence of new social movements in opposition to the planned attacks by the government. Many pensioners are living under the poverty line whilst the very rich and the shareholders are increasing their wealth. Unfortunately the uniting of bosses and workers around a common slogan has shown how class consciousness among French workers has been eroded over the last few decades. Anarchists in France must react to the movement with clear ideas about class opposition, and one of the key demands must be the renewing of public transport which will be free of charge. 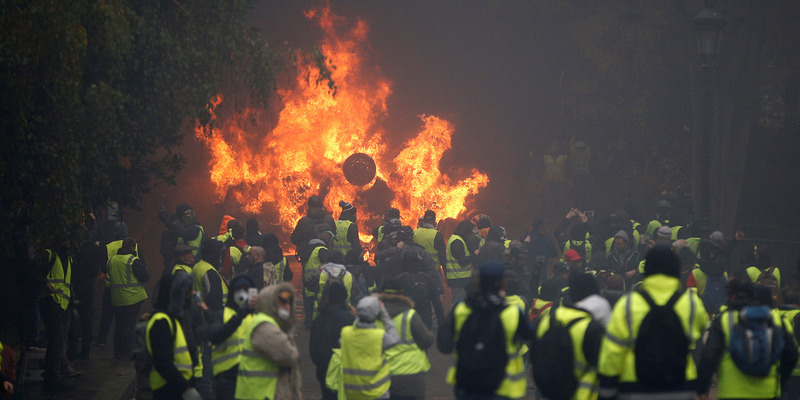 As the movement developed there was widespread police violence against the Yellow Vests. A concerted police attack on demonstrators at Puy en Velay led them to attack the prefecture (seat of local administration). In Paris, police blocked the Champs-Élysées , using tear gas and water cannons. This caused a dispersal into the surrounding wealthy areas. Windows of luxury stores were attacked with an attempted attack on the Bourse (Stock Exchange). In Martigues and Vichy, the Yellow Vests were joined by workers marching behind union banners, although they were not apparent in other cities and towns. In some areas lorry drivers were willing captives of the blockades and mingled with the Yellow Vests. Spoilt for choice; so many threads on the "gilets jaunes" and so little discussion. In The Times yesterday was a report that a restaurateur Yannik Delpech had to lay off 25 workers when his restaurant near Toulouse was set alight in an arson attack. Delpech, clearly a small businessman who wanted to keep his enterprise open had accurately and succinctly on social media described the yellow-vest movement as "conspiracy theorists, anarchists and racists sowing trouble in a social movement underpinned by legitimate claims about the cost of living". While the owner is certainly a member of the petty-bourgeoisie who has his own interests at heart he nevertheless described the movement in clearer terms than many. Tellingly, graffiti daubed on his building called him a "collabo", a favourite term of the "gilets juanes", which, harking back to the Second World War, means that he is a nazi supporter and therefore a legitimate target. I don't think that this sentiment is shared by many workers, even those wrapped up in the movement, but it does show the French nationalism that is the driving force of this movement. Unpublished Nymphalis Antiopa's comment because it's the same article they're spamming across three different articles on the Yellow Vests. If you want to discuss the contents of the article, fine. But don't just write 'You're wrong, click link to find out why'. This is exactly what we asked the ICC to stop doing a few years back. restaurateur Yannik Delpech had to lay off 25 workers when his restaurant near Toulouse was set alight in an arson attack. Delpech, clearly a small businessman who wanted to keep his enterprise open had accurately and succinctly on social media described the yellow-vest movement as "conspiracy theorists, anarchists and racists sowing trouble in a social movement underpinned by legitimate claims about the cost of living". While the owner is certainly a member of the petty-bourgeoisie who has his own interests at heart he nevertheless described the movement in clearer terms than many. So now you resort to quoting bosses' contempt for anarchists, who put anarchists amongst the more obvious arseholes like conspiracy theorists and racists. And this is "clearer"? Typical unnuanced take from Baboon, who apes his co-dogmatists in the ICC. Hi Nymphalis, no that's great/less spammy now as your comment is a contribution to a discussion rather than what it was previously (i.e. 'typical unnuanced take' but no explanation of why and then just a link). Cheers for the cooperation!